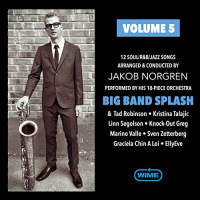 Although Swedish-born and based saxophonist Jakob Norgren's orchestra has been making waves for several years, Volume 5 is only the second of its recordings to churn up the waters in this estuary. And churn them it does, even though Norgren's blend of R&B, soul, pop, blues and funk far outweighs the album's minimal jazz content. Norgren's charts, we are told, encompass songs associated with Otis Redding, Beyonce, Etta James, O.V. Wright, Otis Rush and B.B. King, among others, a statement that must go unchallenged here, as none of those performers has earned a place in this listener's lexicon. To put it another way, Norgren's orchestra is swimming and splashing in uncharted waters, which makes a sober appraisal more perplexing than might otherwise be the case. That said, we shall plow ahead with the ardor of a Michael Phelps until that purpose has been achieved. One thing is clear at the outset: Sweden boasts a surprisingly large number of singers who seem well-versed in these genres, as no less than eight are featured on the album's dozen tracks. Each of them sounds credible, even though that opinion must be tempered by a general unfamiliarity with the music. The last selection ("Well, I Done Got Over It") is especially poignant, as it showcases Sven Zetterberg, one of Sweden's most celebrated soul and blues musicians, who died last year at age sixty-four. The other vocalists are Kristina Talajic ("Love Addict"), Tad Robinson ("Baby, Don't Lose Your Cool"), Graciela Chin A Loi ("Love, Your Magic Spell Is Everywhere," "Suga Mama"), Marino Valle ("Down in the Valley," "That's How Strong My Love Is"), EllyEve ("All I Could Do Was Cry," "Don't Freeze on Me"), Linn Segolson ("Baby, Please Don't Go") and Knock-Out Greg ("You Don't Know," "Working Man"). While Norgren's charts are persuasive and the ensemble well-grounded, whatever splash the album makes rests on one's penchant for soul, blues and their close cousins, R&B and funk, as the album is by no means aimed at a jazz audience. For what it is, however, it seems to be quite well done. Track Listing: Love Addict; Baby, Don’t Lose Your Cool; Love, Your Magic Spell Is Everywhere; Down in the Valley; All I Could Do Was Cry; Baby, Please Don’t Go; You Don’t Know; That’s How Strong My Love Is; Don’t Freeze on Me; Working Man; Suga Mama; Well, I Done Got Over It. 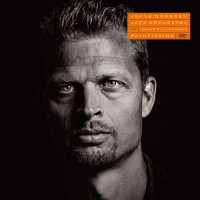 Personnel: Jakob Norgren: leader, arranger, conductor, baritone sax; Fredrik Oscarsson: trumpet; Jan Kohlin: trumpet; Jonne Bentlov: trumpet; David Ljunggren: trumpet; Olle Hedstrom: trumpet; Jens Filipsson: alto sax; Lina Lovstrand: alto sax, flute; Kai Sundquist: tenor sax, bassoon; Christian Herluf Pederson: tenor sax; Fredrik Ruud: trombone; Mats Aleklint: trombone; Magnus Wiklund: trombone; Klas Eriksson: bass trombone, tuba; Kristoffer Siggstedt: bass trombone, tuba; Mathias Lundquist: keyboards; Magnus Josephson: guitars; Lars Ekman: bass; Johan Svensson: drums; Andreas Ekstedt: percussion; EllyEve, Kristina Talajic, Graciela Chin A Loi, Tad Robinson, Marino Valle, Linn Segolson, Knock-Out Greg, Sven Zetterberg: vocals.